I tell you no lie. But the cashews. They almost tasted like chicken. It was kind of weird and kind of amazing. I don’t even like chicken, but they took on this incredible chewy, juicy texture as they soaked up the saucy glory. It was emotional and riveting and another breed of fabulous. Whenever I ask clients what their go-to meal is, they say stir fry. Why do I never make stir fry? I went from being a near stir fry virgin to eating it every day for two weeks straight. Still.Not.Sick.Of.It. The best part about this meal is that is has everything you need in one bowl. My favorite kind of dish! This easy vegetable teriyaki stir fry has everything you ever need and more! My predicament when creating this guy was how to make a good teriyaki sauce without sending my blood sugar into outer space. I solved the issue by using a full can of pineapple tidbits (LOL, who says tidbits?) to cash in on the natural sweetness of pineapple. Then I sweetened the sauce a bit more with Norbu, which is an all natural zero calorie monk fruit sweetener that Arman got me hooked on before he moved away and left me in the dust. I find that it doesn’t have the bitterness that stevia does. The norbu, that is. Moral of the story? Any sweetener will do just fine—maple syrup, honey, agave, brown sugar, or whatever floats your sugar boat. You may just never order take-out again once you try this vegetable teriyaki stir fry. 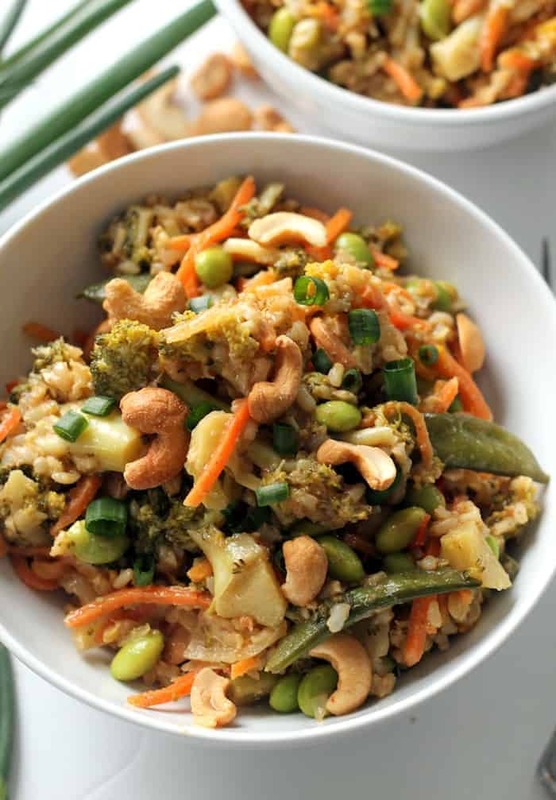 An easy vegetarian stir fry packed with protein and flavor, perfect for a quick vegan and gluten-free dinner! I will do just that and dive right into this! 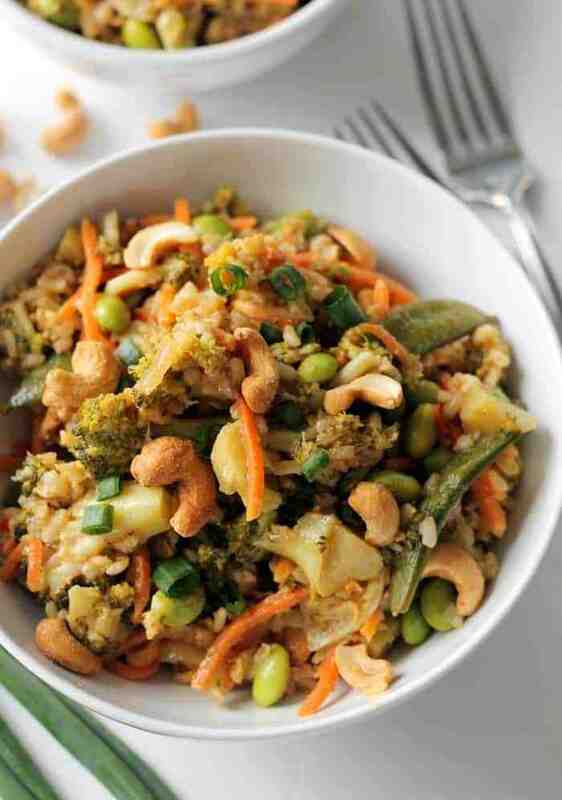 ;) MMMM… gotta love a nice good filling stir fry! This looks AWESOME! mmmm looks SO GOOD! I like how you used chia seeds for thickness– genius! Whata creative way to use pineapple! Everyone knows pineapple is good with asian food, so why not just throw it in with the sauce?! Also, cashews can do no wrong. Love all the veggies here- and who doesn’t love a one pot meal?! I’ll have to try out Norbu… I’m not a huge stevia fan either. Clever girly capitalizing on the sweetness of those tidbits! I love stir fries for the middle of the week when I’m feeling uninspired. Yum! Yes! 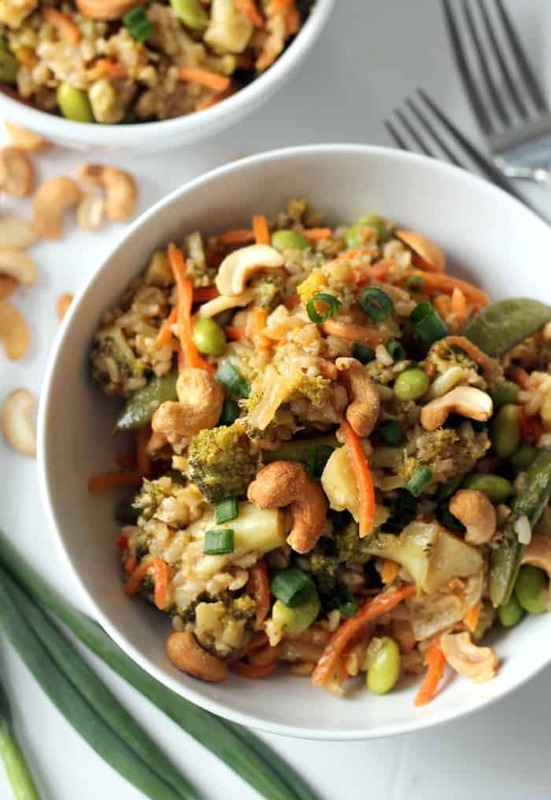 Stir fries are so good for getting extra veggies into your meals. Haven’t made one in awhile so I am going to have to give this one a go! This is GENIUS! I would have never thought to put the pineapple in it. Cannot wait to try this! Made this for dinner last night and am currently sitting at my desk eating leftovers for lunch… I think it might actually get even better the next day! So, so good! And to make it even quicker, I used a frozen bag of mixed stir fry veggies. This will definitely become a regular in my rotation!! I had some tofu lying around and added that too. And I ended up using maple syrup as my sweetener. This recipe is a winner! Thank you! How would I add tempeh instead of edamame? Hi there! I would just finely chop a block of tempeh and sautee in a bit of olive oil until browned. Then stir it in at the end. Hope that helps! I just saw this now. As a novice cook, I really value help. I’m going to make this tomorrow! Thanks for responding! Had this a few nights ago, it was loved by veggies and carnivores alike in the home! The only thing I would change for next time is to hold back the snap peas a little longer, mine were flimsy-floppy by the time the other veggies were crispy-cooked. The whole thing took no time at all, and cleanup was a breeze. A hit for these new vegans! Personally, I think the additional sweetener is not needed ( I used agave) and I thickened with cornstarch (no chia on hand). I also added a drizzle of toasted sesame oil. My husband could not stop eating this – I was hoping to save the leftovers for another dinner! Thank you !